Sri City, July 11, 2018:- Toray Industries (India) Private Limited, the Indian subsidiary of Toray Industries, Inc., a Japanese major producing key materials, hosted a ground breaking ceremony for its new production base in Sri City. Mr. N. Amarnatha Reddy, Hon’ble Minister of Industries, AP Government unveiled the plaque marking the start of project construction in the presence of Mr. Uchiyama, Consul General of Japan in Chennai, Mr. Akihiro Nikkaky, CEO & COO, Toray Industries, Inc. Mr. Shigekazu Suenaga, Managing Director Toray (India), Mr. Talari Aditya, MLA, Satyavedu, Mr. Solomon Arokia Raj, IAS, Secretary, Industries & Commerce Department, AP, Mr. J. Krishnakishore, IRS, CEO, APEDB, and Mr. Ravindra Sannareddy, Founder MD, Sri City. Addressing the gathering Mr. N. Amarnatha Reddy thanked the Toray Management for preferring Andhra Pradesh to set up the unit and assured all support from government. 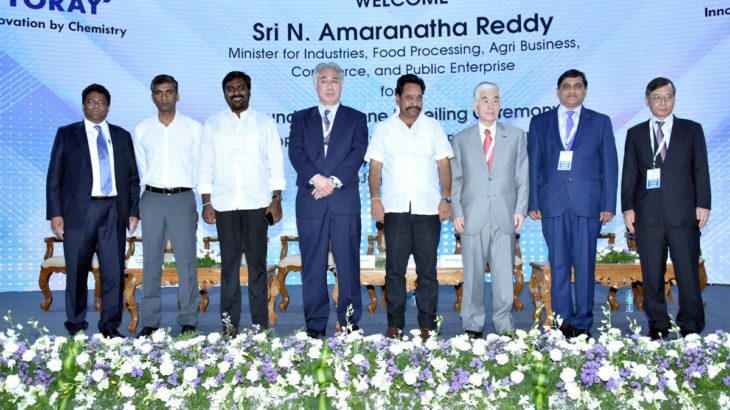 Because of ease of business in the state and industry friendly policy of government, he said that several Japanese companies are preferring AP, particularly Sri City, and second home. Mr. Shigekazu Suenaga, Mr. Uchiyama, Mr. Talari Aditya, Mr. Solomon Arokia Raj and Mr. J. Krishnakishore also spoke. Toray is the 20th Japanese company in Sri City, and this is the second production unit of Toray in India. Its products will be used by diaper makers like Unicharm, Proctor & Gamble and Kimberley Clark and the automotive, electrical and fast moving consumer goods industries. The unit, which will be built on a plot of 85 acre at an initial investment of around Rs. 1000 crores, will have two plants, viz poly propylene (PP) spun bond plant that will produce advanced Technical Textile Meditech used in diaper manufacturing, and the Engineered Plastics Resin Compounding plant that will make raw materials for electrical components of automobiles and in electrical and electronic connectors. While the Plastics Resin Compounding Plant is targeted for start of commercial production in September 2019, the Poly Propylene spun bond plant will be commissioned in March 2020. Both plants put together will initially generate 130 direct and 520 indirect jobs, and these numbers will go up during subsequent phase. Toray Industries Inc. a leading manufacturer of fibers and textiles, performance chemicals, carbon fiber materials, life science and environment engineering, has its presence in 26 countries, across the world. Its consolidated revenues for fiscal 2016 totalled $18.1 billion. In India it established its local head office at Gurgaon and a sales office in Mumbai in 2011. In August 2016, Toray commissioned Toray Kusumgar Advanced Textiles, its first manufacturing unit at Vapi, Gujarat, to make fabric for automotive airbags. and it is the first factory of its kind in India. Toray has its regional office in Chennai.